A laser is a device used to create a narrow, intense beam of very bright light. Laser stands for Light Amplification by Stimulated Emission of Radiation. The light emitted by a laser, either visible light or invisible infrared light, differs from the light emitted by a normal lightbulb in three ways. First, laser light is highly concentrated and moves in a particular direction. Normal light is emitted from its source in all directions. Second, laser light is composed of a single color or wavelength. Third, laser light is coherent, meaning all its light waves are synchronized (vibrating in exactly the same way). These combined properties allow laser light to transmit large amounts of energy or information over a great distance. To produce laser light, energy is pumped into a medium, which may be a solid (such as a ruby crystal), a liquid, or a gas. This energy, either light, heat, or electricity, excites the atoms in the medium, raising them to a high-energy state. As an excited atom returns to its original state, it rids itself of excess energy by giving off a photon, or particle of light. This photon then goes on to strike another excited atom, causing it to release an identical photon. This second photon, in turn, strikes another excited atom, causing the release of yet another identical photon. This chain reaction is called stimulated emission. Two precisely aligned mirrors at each end of the laser material cause the released photons to move back and forth, repeating the striking process millions of times. As each photon is released, its wavelength is synchronous or in step with that of every other photon. As this light builds up, it passes through one end-mirror, which is slightly transparent. In medicine, lasers have been used to perform very delicate surgeries. They are extremely useful because the wavelengths produced by lasers can be matched to a specific body part's ability to absorb the light (known as its absorption band). Since different tissues and cells have different absorption bands, the laser will only vaporize the tissue whose absorption band matches the wavelength of that particular laser light. Absorption band: Measurement in terms of wavelengths in which a material such as living tissue will absorb the energy of laser light. Coherent light: Light beam where the component wavelengths are synchronous or all in step with each other. Photon: Light particle emitted by an atom as excess energy when that atom returns from an excited state (high energy) to its normal state. Stimulated emission: Process of emitting light in which one photon stimulates the generation of a second photon which is identical in all respects to the first. In a relatively short procedure that requires no anesthetic, lasers are used to correct detached retinas and other visual impairments. Lasers are also used to remove birthmarks and tattoos from the skin, seal blood vessels during operations to prevent bleeding, and reopen arteries blocked by fatty deposits. Since a laser beam can be focused down to a very small spot of light, its energy can be extremely dense. When focused on a material such as metal, an infrared laser beam can raise the surface temperature up to 9,032°F (5,000°C). For this reason, lasers are used for the precise cutting of metals, such as drilling long thin holes or cutting complex shapes quickly. 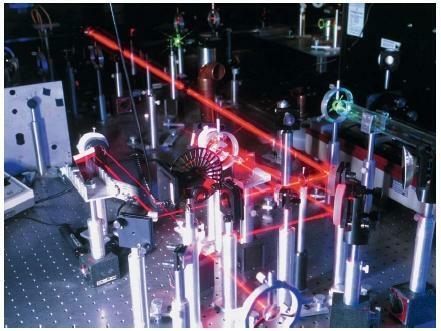 Lasers are also utilized in communications, where a tube of fiber optic material can be used to transmit a beam of uninterrupted laser light over long distances. Supermarkets use helium-neon lasers in checkout lanes to scan price codes. Perhaps the most familiar use of the laser is in compact disc players. Aluminum discs containing audio or visual information are encased in clear plastic. The laser beam then "reads" the information through the plastic without touching the surface and transfers that information to speakers or video screens.